Foot orthoses (“orthotics”) are shoe inserts designed to support and align, or improve the function of the foot. There are different types of foot orthotics available from a podiatrist to treat many lower leg and foot pathologies. Prefabricated orthotics: Are pre-made, off the shelf orthotics which can be used as a quick solution to treat many foot and leg problems. 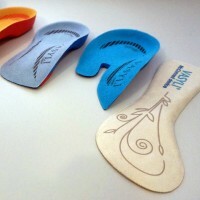 Semi-custom (non-cast) orthotics: Are inserts which are specially made from a tracing of your foot. Custom foot orthotics: Are taken from a plaster impression of your foot and have a prescribed amount of correction. Foot orthotics work by restricting abnormal motion within the feet and enabling normal motion. They also allow the foot to absorb shock properly and stabilise the feet. 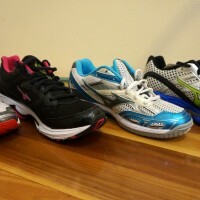 Orthotics provide long term solutions to many foot and lower leg ailments. People of all ages with a variety of foot or lower leg problems may need orthotics. Your Podiatrist will conduct a thorough biomechanical assessment to determine the need for orthotics. Custom Foot Orthotics – What does the process involve? Initially your Podiatrist will conduct a brief biomechanical assessment on the way you stand and walk to determine whether custom foot orthotics are necessary. Following this initial appointment, a more detailed biomechanical assessment will be conducted where more specific measurements and analysis occurs. A plaster impression is then taken of your feet to send to the lab for manufacturing. From the findings of your biomechanical assessment, your podiatrist will create a personal prescription of an orthotic device to suit your individual needs. For anyone involved in any type of physical activity from walking to aerobics to running, it is important that you are correctly fitted with the right shoe for your foot type. Being fitted with the correct shoe will help to prevent overuse injuries and muscle strains as well as improve performance. By identifying the category your feet fit into, you can then be fitted with a shoe that has the appropriate amount of support and cushioning. Contact Sole Podiatry on 9939 1012 to arrange an appointment or find out more about the footwear we stock at our practice click here!